The young amazon resting from the fatigues of the hunt. 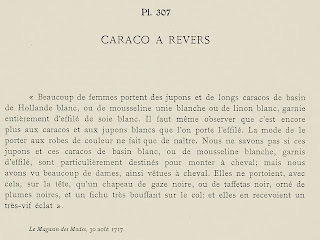 She is coiffed in a Hat surmounted by Plumes and Panaches; she is dressed in a Caraco with revers, with Sleeves à l'Anglaise. 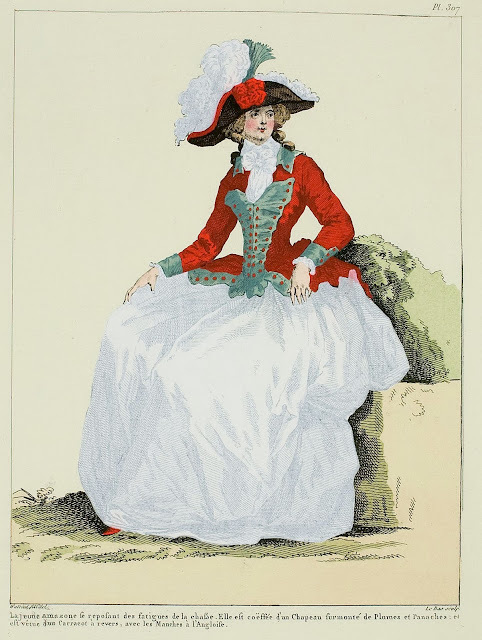 "Many women wear petticoats and long caracos of white Holland basin, or plain white muslin or white linen, trimmed entirely with effilé of white silk. 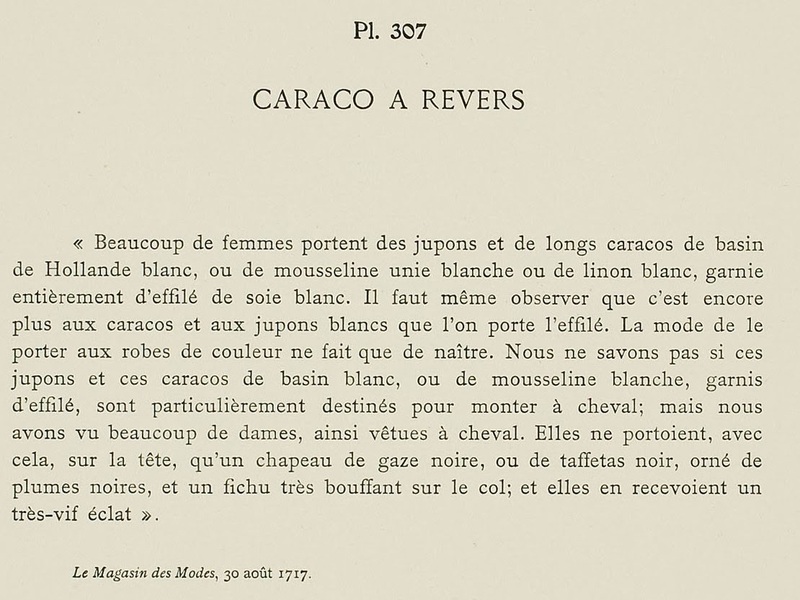 * It is necessary to observe that it is still more frequent for caracos and white petticoats to bear effilé. The fashion of wearing it on colored gowns is only being born. 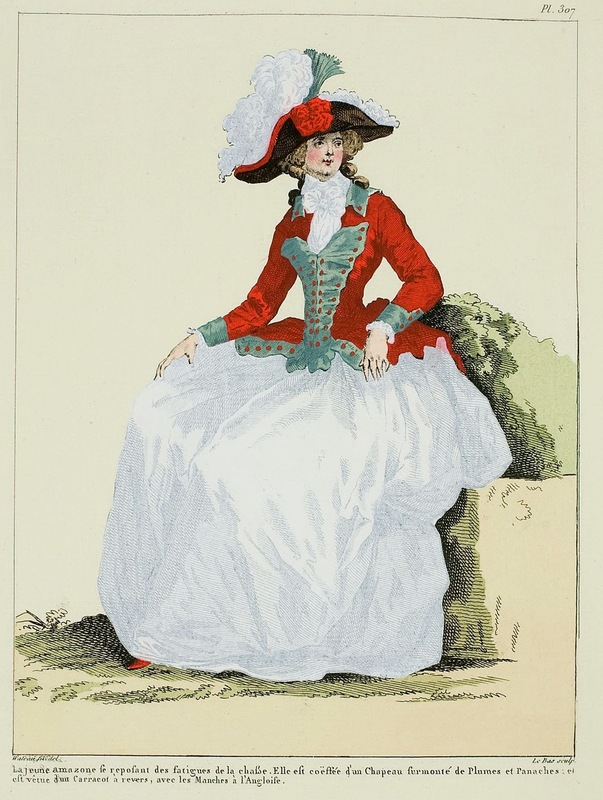 We do not know if these petticoats and caracos of white basin, or white muslin, trimmed with effilé, are particularly intended for riding horses; but we have seen many ladies dressed thus on horseback. They only wear, with this, on their heads, a hat of black gauze, or black taffeta, trimmed with black plumes, and a very puffy kerchief on the neck; and they derive a very-bright éclat from it." * Possibly a fringe of unraveled fabric. Hmm, wearing a white petticoat of any material around horses just seems like a bad idea! Never mind riding in one. I grew up riding and going to shows and I can tell you things never stayed clean for long. Loving the green and red riding jacket in this print. A period riding habit has been on my sewing list for sooooo long!